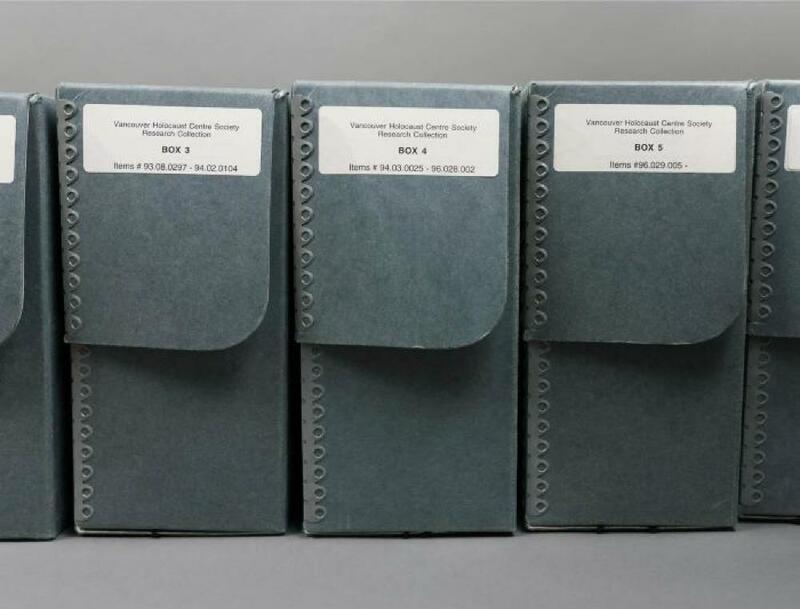 The archival holdings of the Vancouver Holocaust Education Centre (VHEC) contain materials donated by local survivors, families of victims and eyewitnesses of the Holocaust as well as the institutional records of the VHEC. Types of material that may be found in the Archives include identification documents, correspondence, currency, education materials and certificates, photographs, memorabilia, ephemera, newspaper clippings, scrapbooks, travel documents, exhibition and curation records and other items that document pre- and post-Holocaust life, immigration and settlement experiences, internment and the Holocaust. Photo identification must be presented and registration is required prior to accessing materials in the Archives. No food, drink, pens or indelible pencils are permitted when accessing collections materials. Researchers may be required to wear non-latex or cotton gloves when handling artefacts or fragile documents. Paper and pencils are available on site. Researchers may bring their own laptop computers and those wishing to use digital cameras (or camera equipped mobile phones) are asked to consult the collections staff on duty prior to use. Digital copies of materials may be available. Collections staff will be available to answer research questions and help users navigate the VHEC's cross-collection database. The Archives include textual and visual records relating to the experiences of survivors, victims, and their families, before, during and after the Holocaust. These records may contain content pertaining to Nazism, racism and genocide that may be upsetting or triggering. Please allow time for reflection and take breaks when needed. The VHEC Archives are open by appointment Monday through Friday. Researchers may book an appointment in advance of their visit by phoning 604-264-0499 or emailing collections@vhec.org. Learn more about the VHEC's Museum collection.